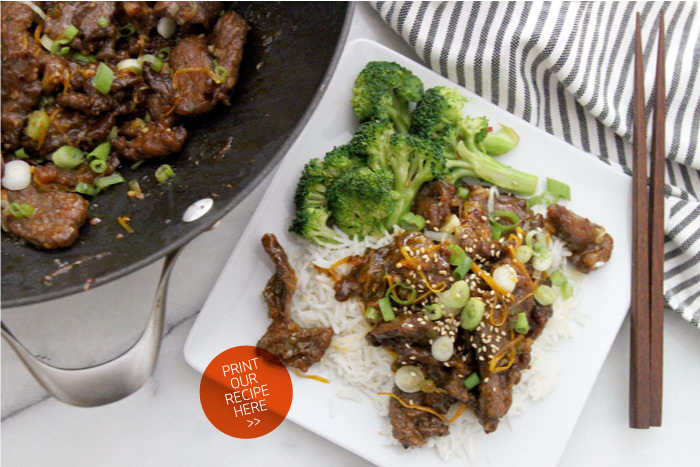 More elevated than your traditional take-out, and much easier to prepare than it may first appear, this Crispy Orange Beef will make the most novice chef feel like a stir-fry master! Lock in the bold flavors of juicy, high-quality beef by quickly deep frying the steak. The steak is then coated with a fresh orange sauce that turns into a complex glaze as it warms. The result is a delightfully bright, slightly spicy, crispy-beef-oasis. 2. Meanwhile prepare the orange zest and juice the orange. Mince the garlic, ginger, and jalapeño. Combine in a small bowl and set aside. 3. Whisk the sauce ingredients together. 4. Heat the vegetable oil in a wok or deep Dutch oven until it reaches 375 degrees F. Working in several batches, deep fry the beef for 1-2 minutes, turning each piece once until cooked. Transfer the cooked beef to a paper-towel lined plate to drain any excess oil. Once all the beef has been fried, carefully remove any excess oil from the wok. 5. Heat the sesame oil in the wok, and quickly stir-fry the orange zest, garlic, ginger and jalapeño for a 1-2 minutes until nicely aromatic. 6. Add the orange sauce to the wok, stir, and heat until thickened. Add the fried beef back into the wok, and stir to combine. 7. Enjoy the crispy orange beef over rice with a generous garnish of scallions and toasted sesame seeds. Serve with stir-fried broccoli for a complete meal.